We are looking for passionate flag-bearers who want to share the benefits of using FreshGrade! The FreshGrade Champion Community provides the opportunity to celebrate all the wonderful things you are doing while also growing and learning together. With new Facebook Groups, Events, and Professional Learning opportunities, there are endless chances for you to increase your learning and development through our Champion Community. 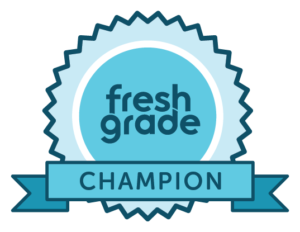 Why Become a FreshGrade Champion? Want to join the FreshGrade Champions Community? By joining you will become a part of our FreshGrade community, which will give you access to dozens of Champion member benefits.